Anti Slip System Technology is the ultimate anti-skid, waterproofing flooring system and it fully cures in just 10 hours. It uses fully reinforced moisture-triggered polyurethane technology to provide a walkable waterproofing membrane. Our recent YouTube demonstration video shows how the Anti-Slip and Anti-Skid Rapid Curing Waterproofing Solution can be applied with ease to most substrates, including existing substrates, ensuring a quick return to service for offshore Oil and Gas platform deck areas, lay down areas and walkway projects. Being liquid applied, the system encapsulates every detail seamlessly, providing a breathable, flexible, slip-resistant, waterproof surface. 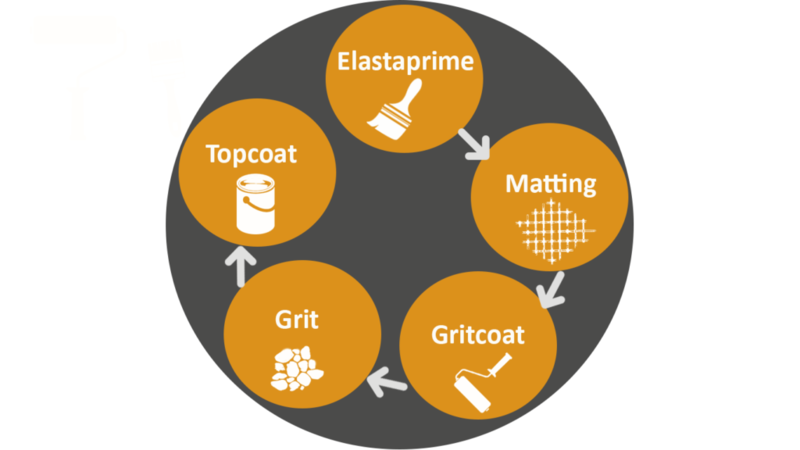 It is essential to ensure surfaces are clean and dry before applying Elastaprime. This high performance universal primer provides excellent binding and adhesion. It’s a two-pack, solvent based anti-corrosive primer containing moisture curing polyurethane prepolymer and unique adhesion promoter and is easily applied by brush, roller or airless spray. The random nature of the weave allows the fibres to be easily incorporated within the system and be moulded effectively to rough and irregular surfaces. When encapsulated, the fibres help provide greater tensile strength and tear resistance to the system. This is a two-pack moisture activated polyurethane coating. This zero-solvent odour long term waterproofing membrane is applied as a base coat with grit broadcast as part of a multi-layer system. While the Elastadec Walkway Gritcoat is still wet, evenly broadcast White Aluminium Oxide grits onto coated areas. This is a wear resistant aggregate for the enhancement of slip resistance. To deliver maximum durability, the resin system is aggregated with white aluminium oxide grits. This slip resistant material is second only to diamond in hardness and provides an incredibly durable surface that outperforms systems which incorporate quartz. It also has an exceptionally wear resistance in situ. This is a zero-solvent odour, flexible top coat to encapsulate anti-slip aggregates and provide a durable, full gloss finish. It’s a high solids two-pack flexible sealercoat based on a polyaspartic resin system. 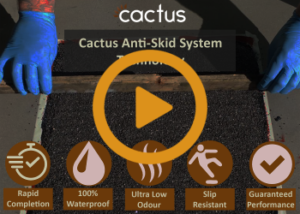 Click the image above to watch our demonstration video and see how quickly and easily our Anti-Slip Refurbishment System Technology can be applied and cures.